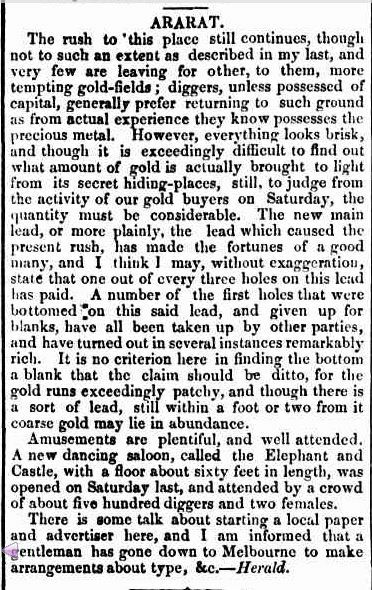 It was a chance discovery while searching the fifteen or so years of the Hamilton Spectator available at Trove. There in the search results was an article from 1910. That wasn’t expected when only the WW1 years and the decade 1870-9 were available. Curious, I tried a search of “Harman” and the result was dozens of articles from the 1880s to 1910. Trove had surprised me adding a further three decades of Specs and I couldn’t have been happier. Since that day a couple of months ago, I have searched, tagged and found out an incredible amount of new detail about my Hamilton district families. Also, surnames, street names and locations bring such a sense of familiarity when reading my hometown newspaper, even issues from 100 hundred years before I was a resident. One of the first items of interest I found was an obituary for my gggg grandfather Joseph Harman from 1893. His son James converted to Methodism around 1851 while still in England. Joseph, entrenched in the Church of England, didn’t share his son’s enthusiasm for Methodism. However, when the Harmans moved to Byaduk in 1863, the first church built was Wesleyan Methodist and James Harman, by then a Local Preacher, was one of the forces behind the church. Joseph had little choice but go along to Methodist services, but as soon as a Presbyterian Church was built at Byaduk eighteen years later, he made that church his Sunday morning destination. There were no family loyalties when it came to Joseph’s faith. 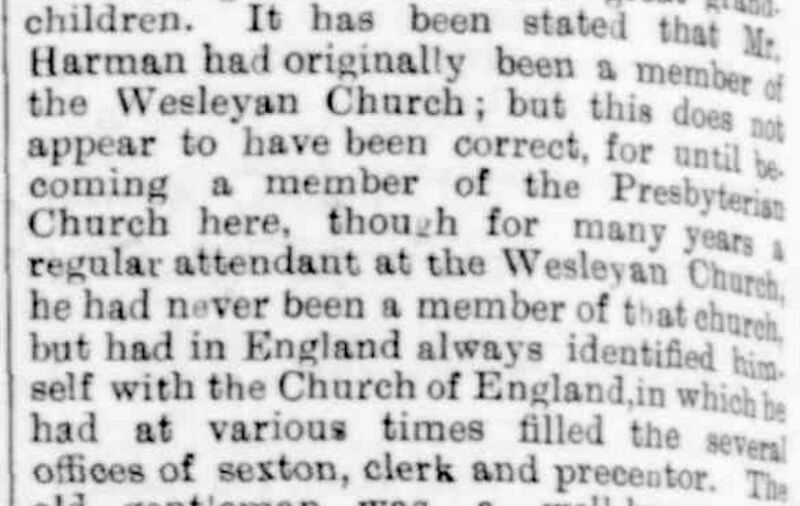 It would seem that although the new church wasn’t Church of England, it was more to his liking than the teachings of John Wesley. Granted the Presbyterian Church was less than a mile down the road from his home but the Methodist church was only that distance again further on. “Items of news.” Hamilton Spectator (Vic. : 1870 – 1918) 30 March 1893: <http://nla.gov.au/nla.news-article225177127&gt;. 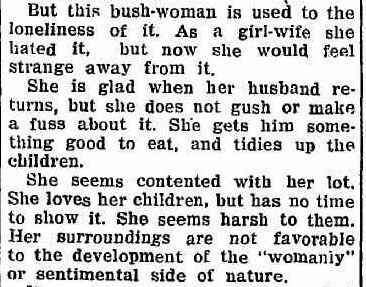 Also found was a rare obituary for a female family member. Although it doesn’t tell me much about my ggg grandmother Sarah Hughes‘ life, the 400 mourners at her funeral tells me something of the sort of person she was. “Items of News.” Hamilton Spectator (Vic. : 1870 – 1918) 23 May 1885: <http://nla.gov.au/nla.news-article225661135&gt;. There are also some great articles about Sarah’s husband James Bishop but I’ll save those for a post just about him because he was a character. 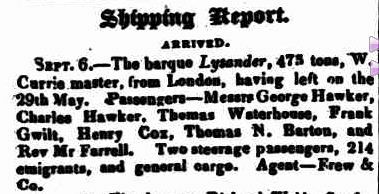 Something I enjoy reading in old newspapers is the seemingly mundane day-to-day goings on in a town. Of course, it’s even better when a story includes a family member. 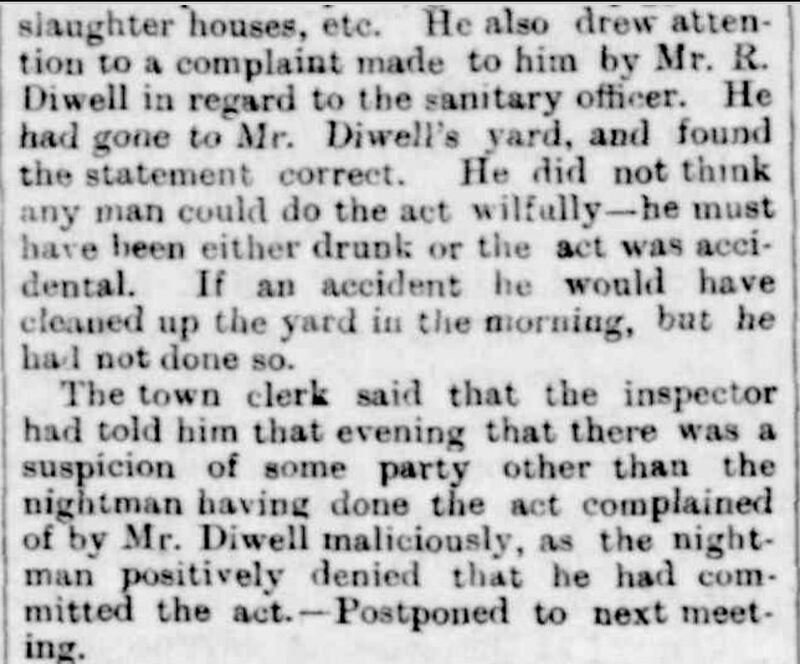 Like the time in 1899 when my gg grandfather Richard Diwell of Hamilton complained about the night soil man. “HAMILTON BOROUGH COUNCIL.” Hamilton Spectator (Vic. : 1870 – 1918) 14 October 1899: 2 (SUPPLEMENT TO THE HAMILTON SPECTATOR). . 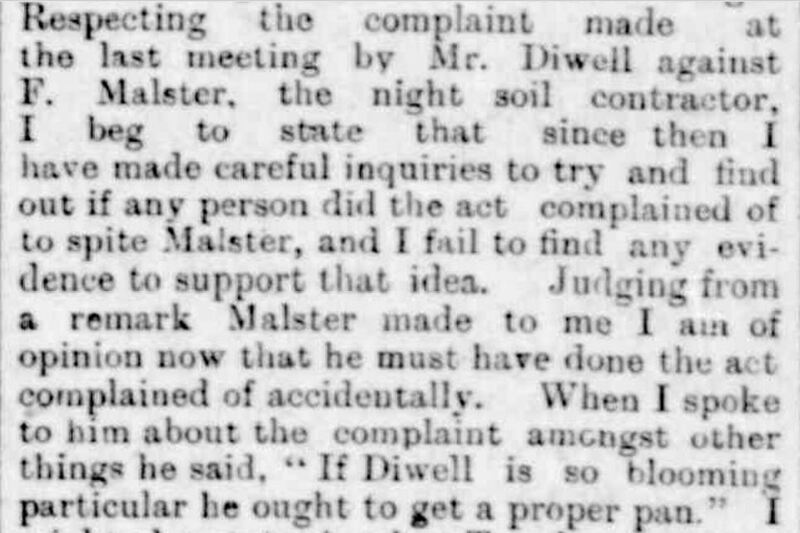 The night soil man Frederick Malster was given the right of reply after the investigation into Richard’s complaint. “HAMILTON BOROUGH COUNCIL.” Hamilton Spectator (Vic. : 1870 – 1918) 28 October 1899: 2 (SUPPLEMENT TO THE HAMILTON SPECTATOR). . CORNER OF GRAY & THOMPSON STREETS IN 1888. Hamilton Spectator (Vic. : 1870 – 1918) 17 April 1888: 2 (SUPPLEMENT TO THE HAMILTON SPECTATOR). THE PRESENT VIEW OF THE CORNER OF GRAY & THOMPSON STREETS. 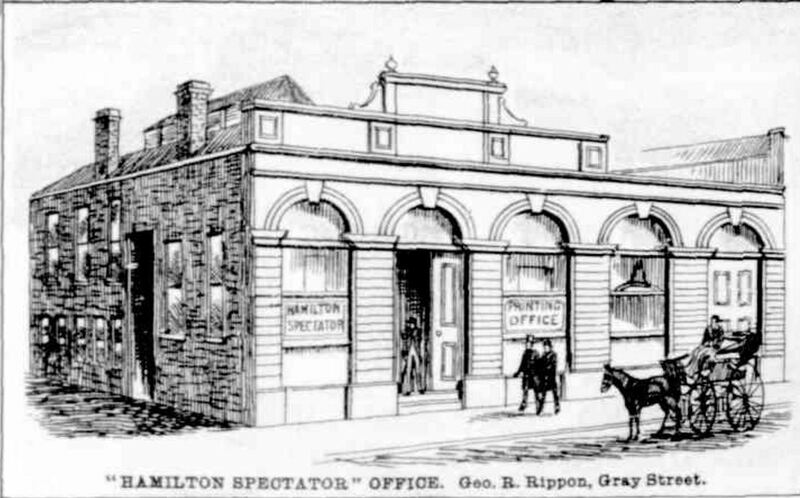 HAMILTON SPECTATOR IN 1888. “VIEW OF HAMILTON VICTORIA.” Hamilton Spectator (Vic. : 1870 – 1918) 17 April 1888: 1 (SUPPLEMENT TO THE HAMILTON SPECTATOR). THE HAMILTON SPECTATOR AS IS IT TODAY. A former Melbourne newspaper Table Talk (1885-1939), a weekly social publication, had its release online at Trove at few months ago. It quickly went on my list of favourite newspapers for the photos, the fashion and the insight into the social life of Victorians, particularly the upper classes. There was no need for Facebook in those days. Socialites just had to share their status with Table Talk and friends could read with envy of trips to London, extended stays in fine Melbourne hotels or a day at the local fox hunt. In a Trove Tuesday post in June, I lamented that I had been unable to find any family members in Table Talk. I dug a little deeper and finally I found a photo of a 2nd cousin 2 x removed, Pauline Florence Marchant. Pauline was the daughter of Percival “Percy” John Marchant and Elsie Annie Hughes of Geelong. 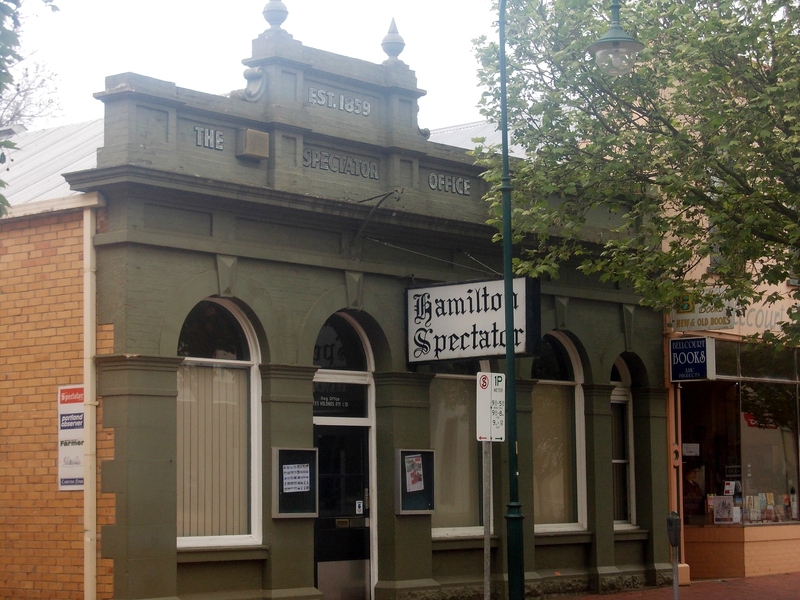 On her paternal side, Pauline was a granddaughter of Samuel Thomas Marchant, a well-known optician from Geelong and later Melbourne, and Emily Jane Entwistle. On her maternal side, she was the granddaughter of Frederick Charles Hughes and my ggg Aunt Martha Harman of Hamilton. 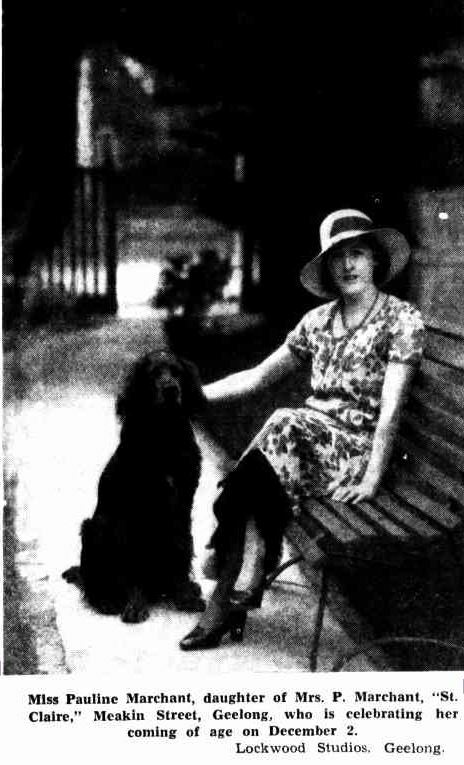 Pauline was photographed at St Claire, her families’ residence near the Geelong Botanical Gardens. St Claire is a lovely home and still stands today. Pauline’s father Percy was also an optician as was her maternal uncle Russell Hughes of Hamilton. Table Talk is full of Western District people so check it out. Because of time restrictions, I’m not participating in the 2014 Australia Day Blogging Challenge. 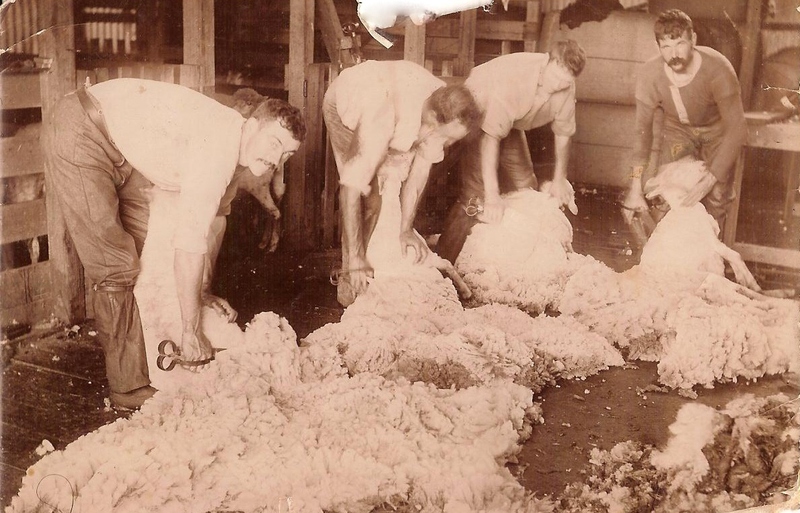 Don’t despair, some great geneabloggers have written posts for the 2014 Australian Day Challenge, a Geneameme, C’Mon Aussie created by Pauline Cass of the Family History Across the Seas blog. The following year threw up a new challenge and for 2013, the task was to write the story of my first ancestor to arrive in Australia. I decided not to go with my ggg grandparents Thomas Gamble and Ellen Barry, both early arrivals, because I had told their stories on other occasions. Instead I chose Sarah Hughes, another ggg grandmother, who I had suspected arrived in 1840. The Hamilton Brass Band has played a big part in lives of some of my family members, especially the Diwell and Gamble families, and there are still descendants of those families in the band today. Another family member, Frederick Hughes the husband of my ggg aunt Martha Harman was a long-standing leader of the Hamilton Brass Band. 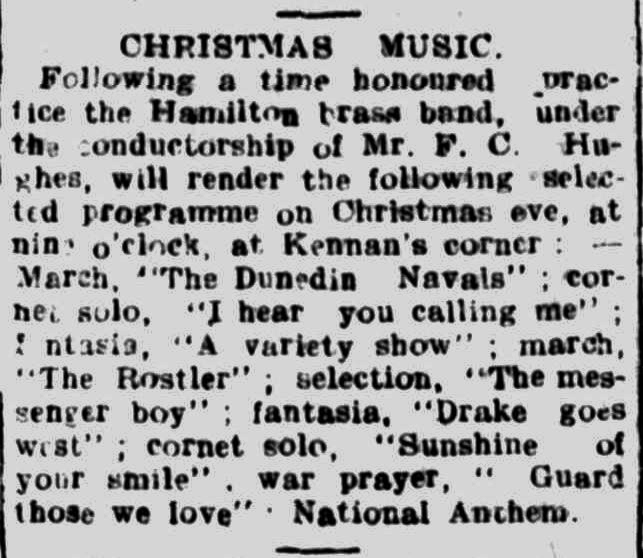 With Christmas just around the corner, I thought I would share this little snippet found at Trove, from the Hamilton Spectator of December 22, 1917. An annual tradition for the band, was to play on “Kennan’s corner”, (the corner of Gray and Thompson Street) on Christmas Eve. Freddie Hughes, a Hamilton jeweller, was band leader. Interesting not a Christmas Carol in sight on the program. Band music is my blood, so I just had to find a rendition of one of the pieces on the play list, “Sunshine of Your Smile”, to take me to Kennan’s Corner, Christmas Eve, 1917. March Passing of the Pioneers once again gathers together a diverse group of Western District pioneers. They include a winemaker and a lighthouse keeper. There are links to some well-known Western District properties and families, and a Portland resident that grew up with an English author. Eliza Mary KEARTON: Died March 1891 at Creswick. Eliza Kearton was a long-time resident of Portland. She had gone to Creswick for an operation but died of complications. She was born in London in 1820 and married William Tulloh in 1844 in Tasmania. William’s obituary appeared in Passing of the Pioneers in July 2011 and includes a lot of detail about their lives in Portland. James ROBERTSON: Died March 1892 at Portland. James Robertson was born in Alvie, Scotland. Once in Portland, he set up the Iron Store business with his older brothers John and William Robertson. Anne WILCOX: Died 12 March 1894 at Portland. Anne and her husband Thomas Must were well-known residents of Portland. 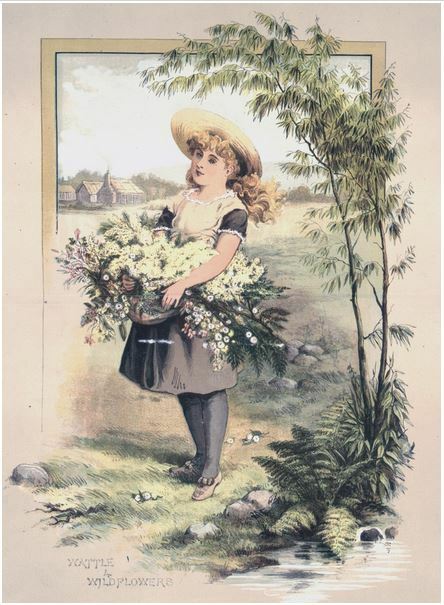 Anne was from Sydney and married Thomas a Sydney merchant in 1842 before they travelled to Portland to set up a branch of Thomas’ business, Must and Flower. A few years after his arrival in Portland, he had an architect design a home resulting in Prospect, built in 1855.The couple lived there for the rest of their lives. In 1908 at St Stephens Church, unveiled a stained glass window in memory of Mr. and Mrs. Must. Ann PAXFORD: Died March 1900 at Portland. Ann Paxford was the daughter of Jonathan Paxford and Ann Bray and was born around 1818. She married Edward Francis Hughes and they arrived in Victoria in 1853 and Portland in 1854. Ann had an interesting life while a child in England. She spent time with a young Marion Evans better known as George Elliott, writer. Looking further into the story, which appears correct, proved intriguing. Ann, through her mother, Ann Bray was related to Charles Bray a ribbon manufacturer and a leader of the “intellectual elite”. (Oxford Dictionary of National Biography) He described his house, Rosehill, as “a mecca for radicals and intellectuals” (The Continuum Encyclopedia of British Philosophy in Oxford Reference). Marion Evans lived at Rosehill and that is where Ann would have come to know her. Janet McCRACKEN: Died March 1911 at Stawell. Born in Scotland around 1840, Janet McCracken arrived in Melbourne with her parents in the early 1850s. 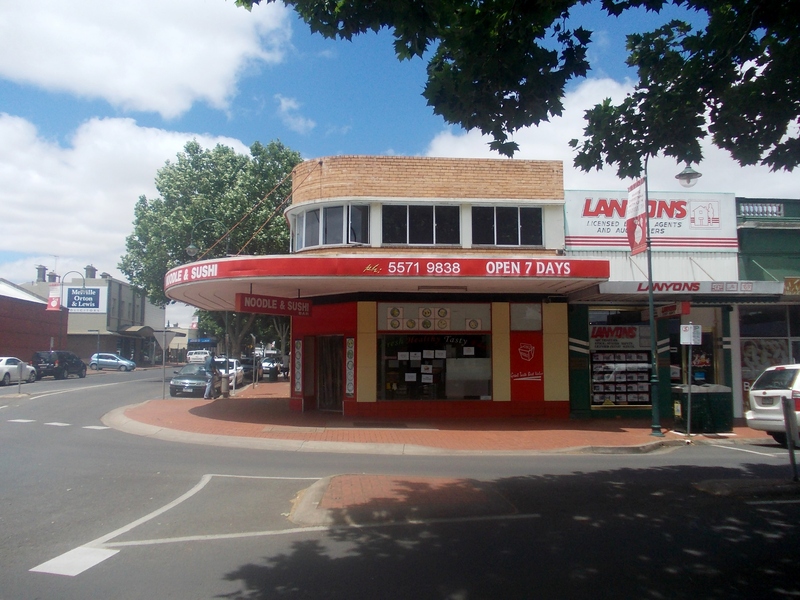 After a few years, they moved to Stawell and Janet married James Mathers. 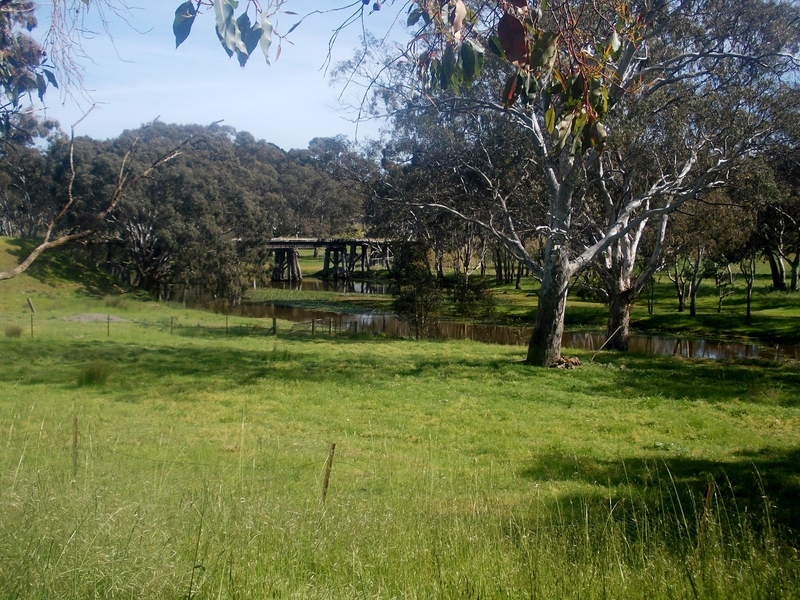 The couple lived in Stawell for the rest of their lives and had four sons and three daughters. Daniel TYERS: Died 15 March 1915 at Byaduk. 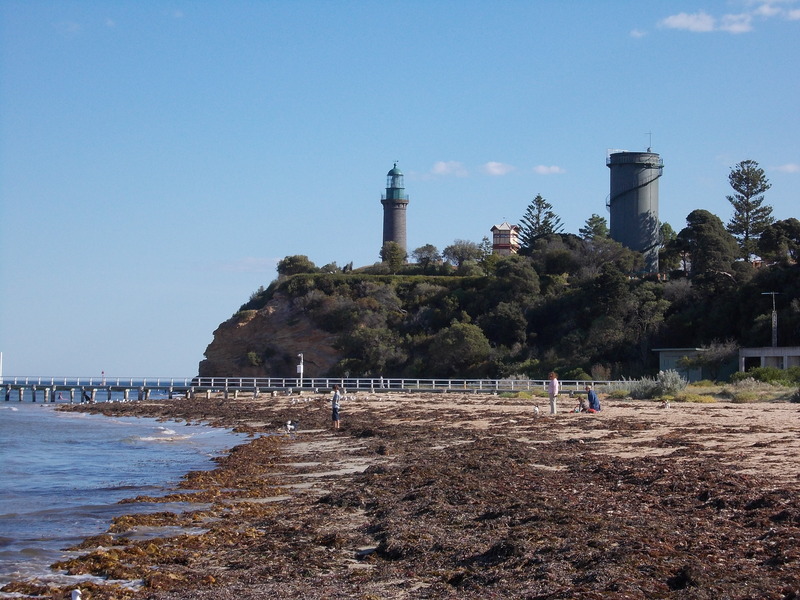 After arriving in Victoria around 1856, Daniel Tyers lived at Port Fairy. He later moved to Byaduk where he remained until his death at the age of ninety-five. He was buried at the Byaduk Cemetery along with his brother Samuel and sister Jane. John MOONEY: Died 29 March 1915 at Mooney’s Gap. In 1854, John Mooney from Ireland, travelled to Australia aboard the Great Britain. His brother Lawrence had arrived the year before, so John joined him on the Ararat diggings. 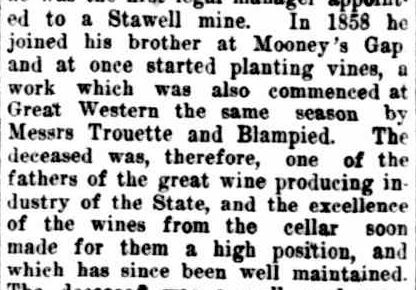 In 1858, the brothers planted grape vines at Mooney’s Gap near Ararat and started the Emerald Vineyard. In the same year, just down the road, Jean-Pierre Trouette, his wife Ann-Marie and brother-in-law Emile Blampied, were the first to plant vines at Great Western. While Troutte’s winery St. Peters no longer exists, other wineries from the early days, Best’s and Seppelts are still in production there. In 1925, Lawrence Mooney uprooted the vines at Emerald Vineyard and used the land for other purposes. Elizabeth Robertson MURDOCH: Died 7 March 1916 at Port Fairy. I did a little extra research at Ancestry.com.au on Mrs Whiting because I wanted to find her name, in preference to listing her as Mrs Albert Edwin Whiting. 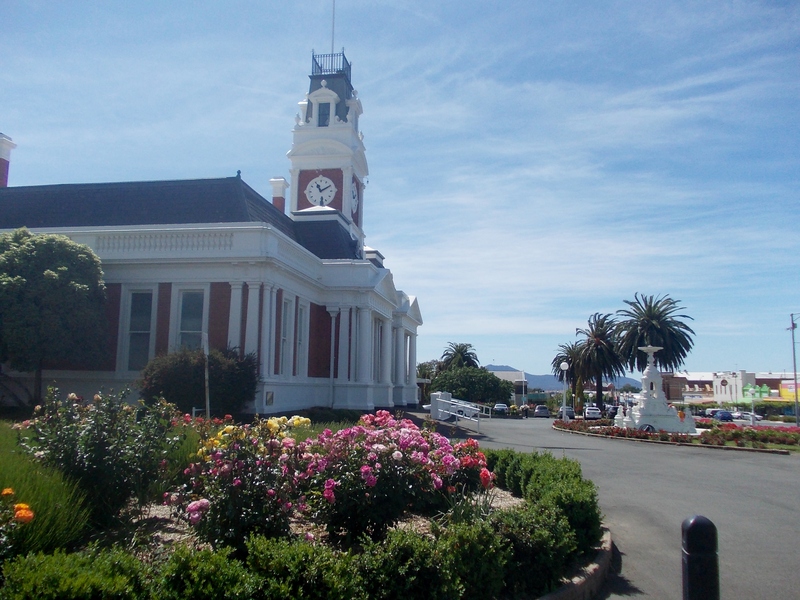 Elizabeth grew up around the Geelong area and married Albert Whiting in 1878. Albert was a son of Edwin Whiting and Hannah Manifold. Hannah’s brothers were Thomas, Peter and William Manifold, original owners of the Purrumbete run. 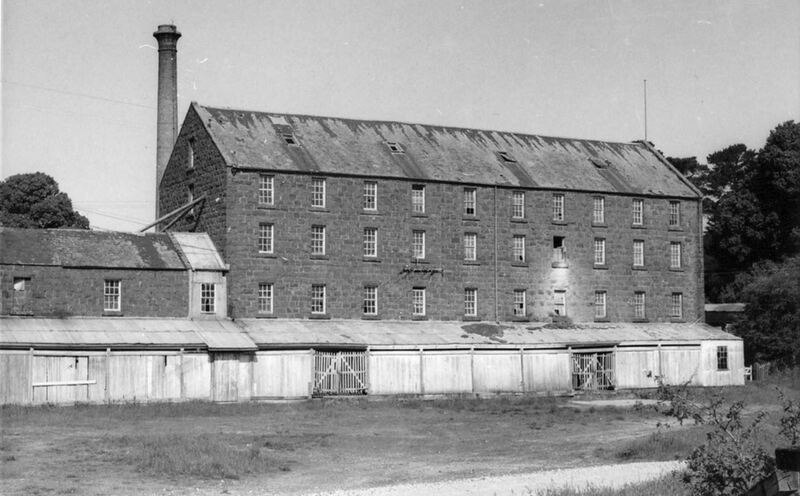 At the time of marriage, John was station manager for the Chirnside’s property Boortkoi. Their wedding was at Woolongoon, Mortlake then owned by Anthony McKenzie. 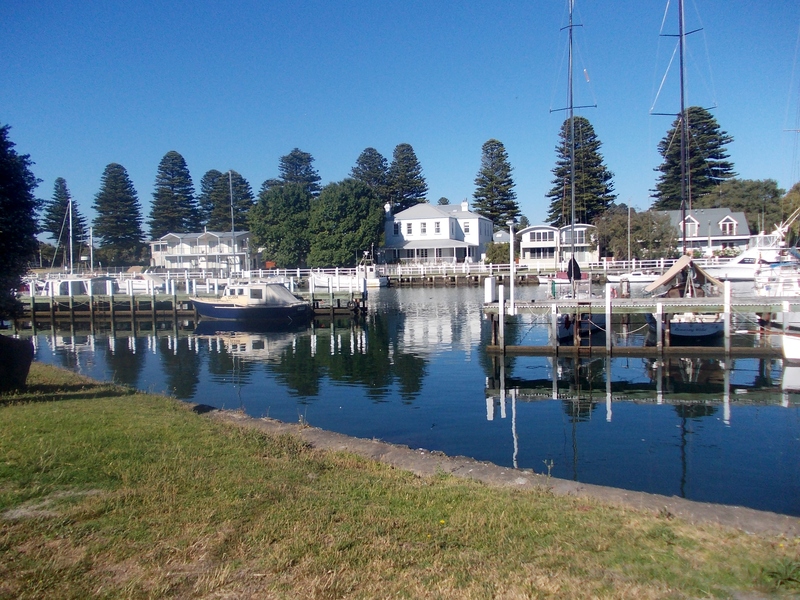 Elizabeth and Albert moved to Port Fairy and lived at Boodcarra before moving to Loongana for several years before Elizabeth’s passing. William HILL: Died 14 March 1916 at Warrnambool. Born in Ireland, William Hill spent the first twenty years of his time in Victoria working for Henry de Little, owner of Caramut station. He then began farming himself, first at Woodford and later at Framlingham where he had dairy cows for seventeen years. In the early 1860s, William married Mary Hassett of Caramut. Mary FITZGERALD: Died 17 March 1916 at Tower Hill. Mary Fitzgerald lived in the Tower Hill district since she was ten- years-old, around 1849. She married John Fitzgibbon and she left two sons and eight daughters at the time of her death. Her funeral was attended by a large crowd of mourners. John Joseph Thomas COOPER: Died March 1918 at Port Fairy. John Cooper was born in Somerset, England and arrived in Victoria with his parents as a baby. He became an assistant life boat pilot in 1883 and became the Superintendent of life boats at Queenscliff in 1892. 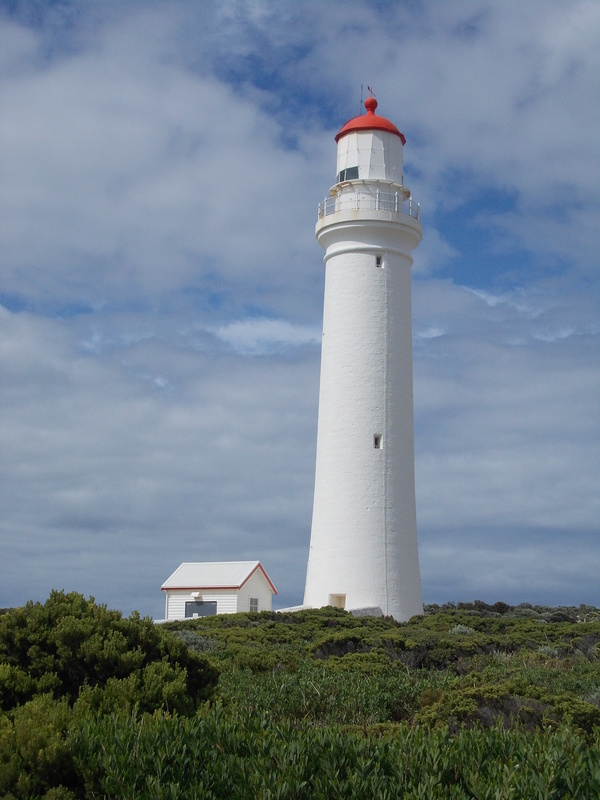 Around 1905, he moved on to lighthouse keeping, working at Queencliff, Port Fairy, Cape Nelson and Warrnambool. Marion Letitia HINDES: Died 13 March 1918 at Port Fairy. Marion Hindes, better known as Letitia, was born in London in 1848 and arrived in Port Fairy four years later. 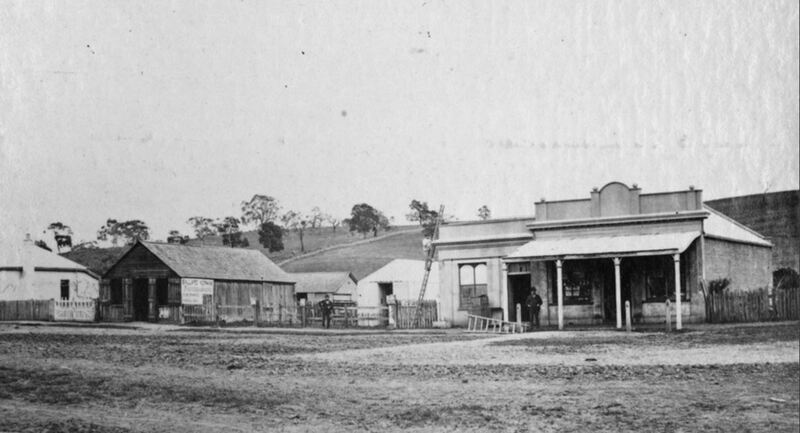 She lived with her aunt, Mrs Gillespie at the Union Inn at Port Fairy. Letitia married Richard Emery in 1889. Richard died eight years before her and she left no children. She had two cousins surviving and two nieces. Margaret WHITE: Died 4 March 1925 at South Portland. Margaret White spent most of her life living in the Narrawong and Portland districts, an estimated eighty-two years. She married James Grant in 1870. She left two sons and three daughters. Margaret’s obituary mentions the hardships faced by the early settlers. 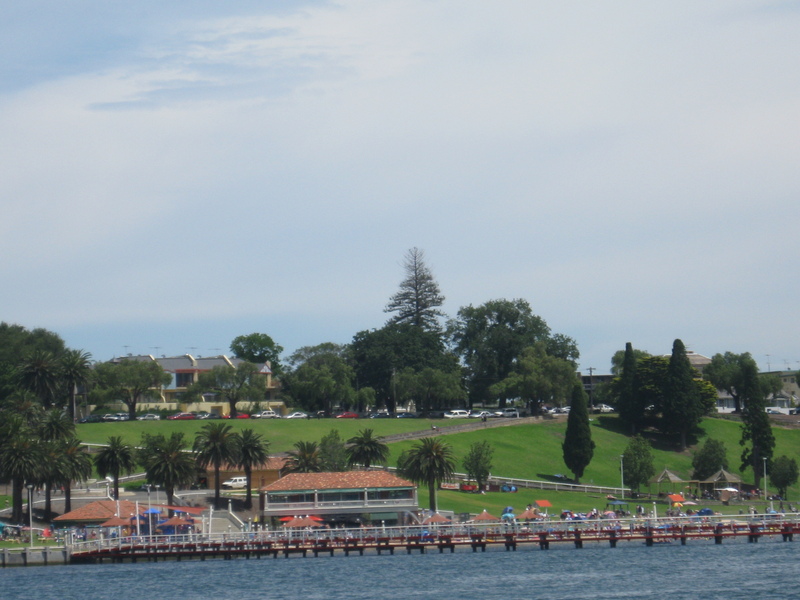 This post was written for the 2013 Australia Day Blog Challenge organised by genealogist Helen V. Smith. The brief for the challenge was “Tell the story of your first Australian ancestor”. Easy – Ellen Barry arrived in 1840 on the Orient. But you have heard enough about Ellen and her husband Thomas Gamble, another early arrival (and possible convict). Most of my other ancestors were 1850s Assisted Immigrants. Maybe I could go with a hunch. 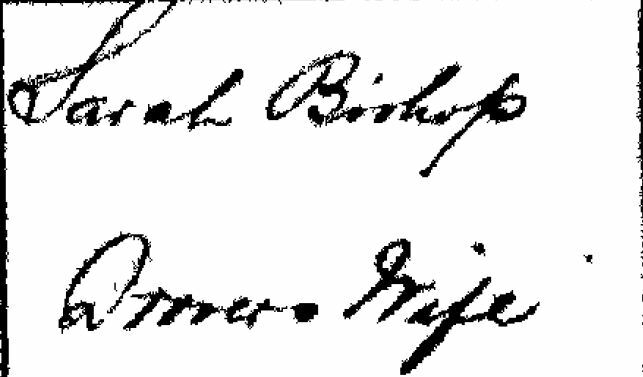 My ggg grandparents James Bishop and Sarah Hughes have been difficult to research. I eventually discovered they married in Adelaide in 1852. A few years ago, on the passenger list of the Lysander an 1840 arrival to Adelaide, I found Robert Hughes, his wife and four daughters. As Sarah’s father was Robert, I’ve kept the Lysander filed away in my mind (yes, there are probably better places), occasionally having a search around the records hoping for something new. For this post, I decided to try to find, the arrival date of either Sarah or James, but I had to choose. Firstly, I would need to pay for a digital image of a Death Certificate simply because I was short of clues. This was still cheaper and faster than ordering a hard copy of their South Australian Marriage Certificate. I’ve posted about James before and I know something of him but nothing of Sarah except she gave birth to eleven children, but I did want to know more. Also, as Sarah passed away before her husband, the informant would most likely have been James and, if he was still of sane mind, information would be more accurate than that on his own certificate. He died ten years later in 1895 and his informant may not have known the detail I was after. Based on that reasoning, Sarah it would be. So I ordered the certificate and waited, with fingers crossed for the digital image to appear. More often than not when I order a certificate, I end up disappointed. I was, on this occasion, pleasantly surprised. The column I was most interested in was “How long in the Australian colony”. 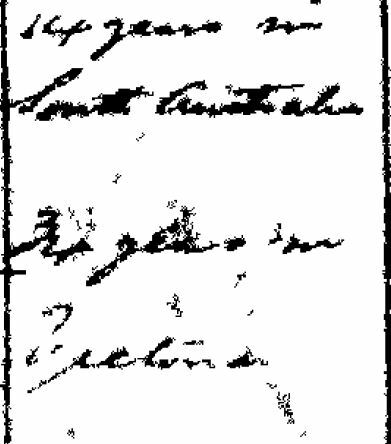 It read, “fourteen years in South Australia”, in Victoria…almost illegible but it looks like thirty-four years. What do you think? It does not prove that Sarah came on the Lysander but it does qualify her as an early arrival, so let the story begin. I have told much of the Bishop family story in the post “Jim’s Gone A-droving” but what of Sarah’s story? 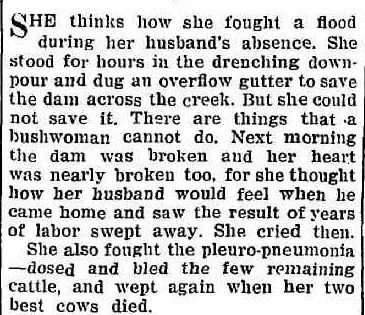 I know so little about her but with help from Henry Lawson’s “The Drover’s Wife” one can wonder and imagine what life was like for her. While I don’t believe that she felt the isolation experienced by Lawson’s “wife” she must have felt the same loneliness. Sarah Hughes was born in Brighton, East Sussex, England in 1834 to Robert Hughes and Mary Godfer. Robert was a sailor according to Sarah’s Death Certificate. As a child, Sarah arrived in Adelaide. By 1852, aged eighteen, she had met and married James Bishop from Dorset, nine years her senior. 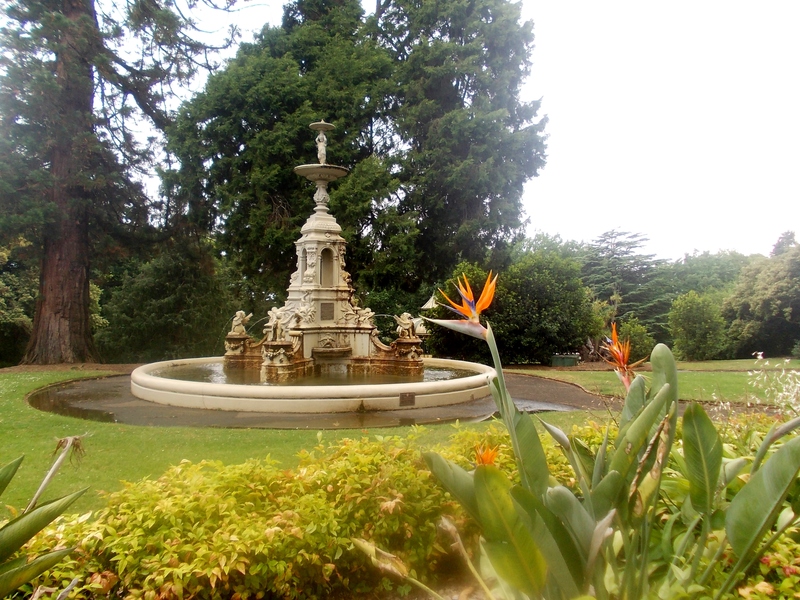 They lived at Thebarton, just north-west of the Adelaide city centre. Eight days short of their nine month anniversary, Sarah and Jim welcomed a daughter, Mary Elizabeth, named after her two grandmothers. For most of his working life, Jim was a drover. The following article describes a James Bishop, working as a shepherd near Gawler, South Australia in 1853. This could well be my Jim, off working early in the marriage. I have often wondered why only one child was born during the Adelaide days from 1852-1855/6, considering the speed of conception of the first child and frequency of the later children. Maybe Jim was away working? Could the gaps between the eleven children be a measure of Jim’s absences? Baby Mary passed away in 1855 and this may have been a catalyst for a move. Or was it gold? Jim and Sarah next turned up in Ararat where a new lead was found in early 1856. Would life as a miner’s wife be any different to a shepherd’s wife? The goldfields were harsh for women, in the minority and left alone while their husband’s sought to change their fortunes. There was the cold (and Ararat can get very cold), the mud, the heat and dust. Their home was either a tent or hut. 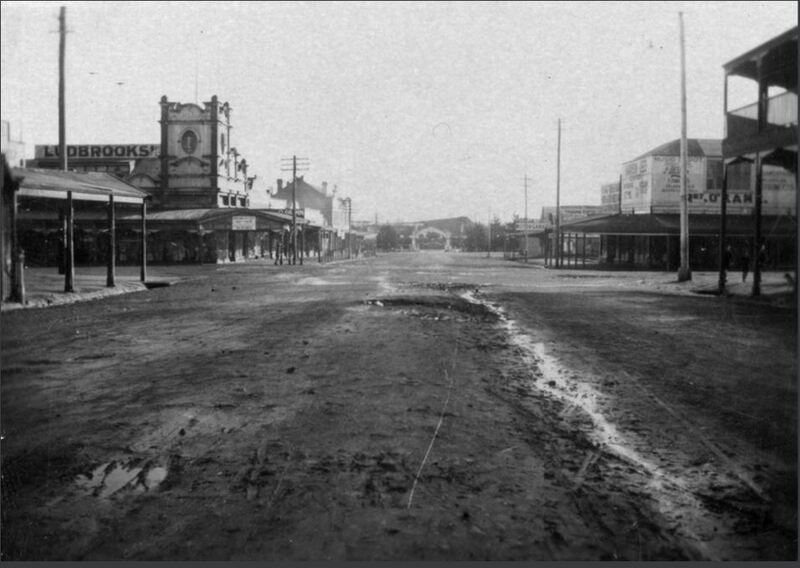 Settled in Ararat, Sarah gave birth to three children in four years, including my gg grandmother Elizabeth, if lucky a midwife at best assisted or another miner’s wife. 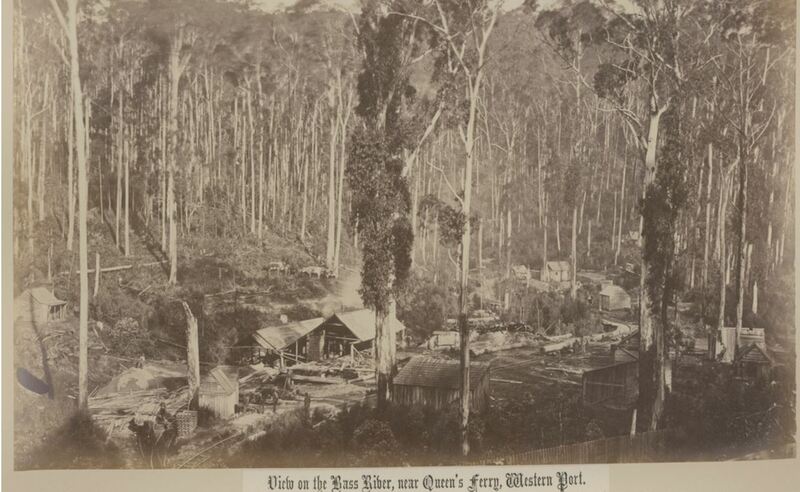 Disease lurked on the goldfields, a constant worry for a mother with young children. 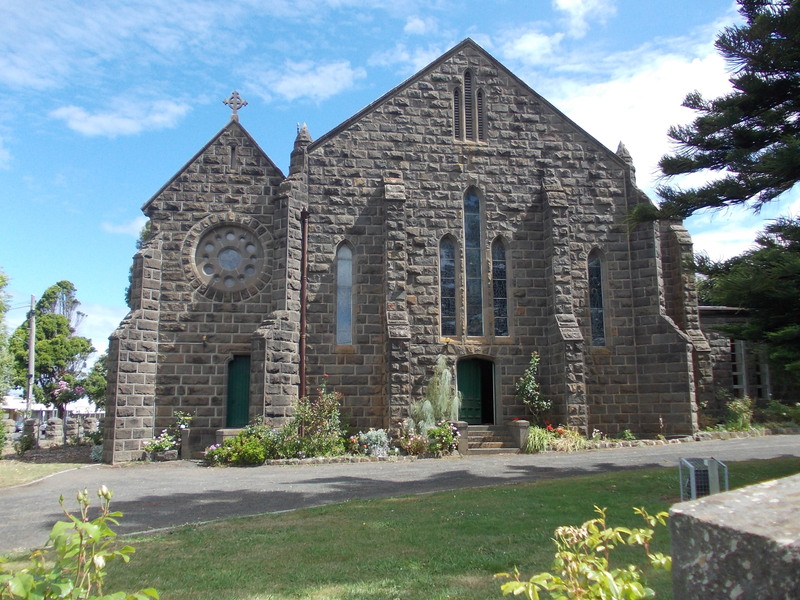 Seemingly luckless, the Bishops moved to Mount Gambier. Jim would have turned to droving by this time. While they were in Mount Gambier, Harriet was born in 1860 and Ellen in 1862. By 1865, the family had moved to the Macarthur/Byaduk area and in the same year, after a break of three years, Sarah gave birth to a daughter. She called her Mary after the child she lost 10 years before. During Jim’s absences, he often took cattle to the Adelaide markets, Sarah would have faced the harshness of the land on her own. By 1870, she had eight children from a newborn to fourteen. That year, Jim selected sixteen acres at Warrabkook, out of Macarthur. At least the older boys could have helped her with daily farm tasks and Elizabeth, thirteen and Harriett, ten, with the babies. Sarah’s relationship with James is something I wonder about. Nine years younger than him and only a girl when they married. Drovers were stereotypically hard-drinking men adapted to long periods alone. 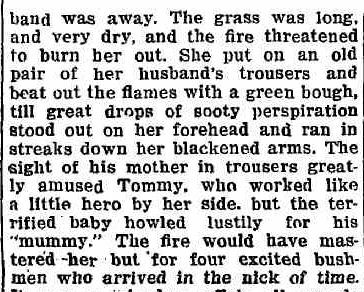 Margaret Kiddle in her book, Men of Yesterday, A Social History of the Western District of Victoria described drovers as “…hardbitten, sunburnt and blasphemous.”(page 411) How did Jim adjust back at home? The peace of life on the road with a mob of cattle would be very different to a home full of children. Did Sarah do as Lawsons’ drover’s wife and not make a fuss? 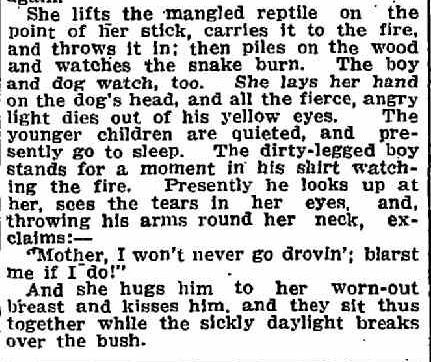 As Lawson’s “Drover’s Wife” killed a snake that terrorised the family in their home, her eldest son, with some sense of her emptiness, declared “Mother, I won’t go drovin’, blast me if I do”. For Sarah, this was not the case. Eldest son Charles worked as a drover. Third son Robert worked as a drover. The droving blood ran deep. 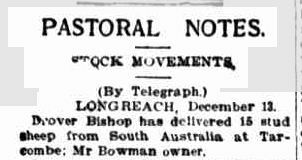 The 1913 Electoral Roll lists Sarah’s grandson Hubert Nathaniel Gurney Bishop, with the unmistakable name and son of Charles, as living in Longreach, Queensland. I believe this his him. 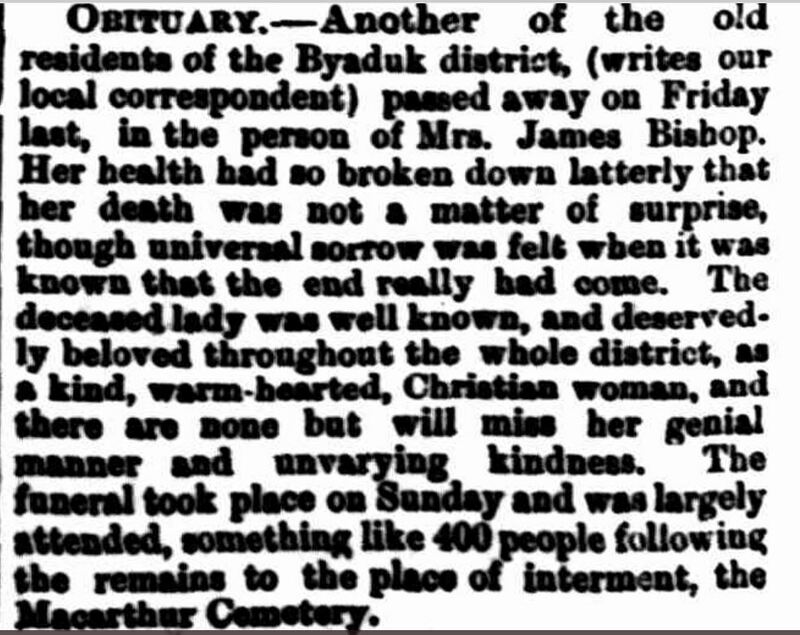 Sarah died on 15 May 1885 at Byaduk from pulmonary tuberculosis. Buried at only fifty-one at the Macarthur cemetery. The Wesleyan minister presided. On Sarah’s death certificate her profession was not home duties, or wife or even mother. It was a role that was all of those and more…drover’s wife. After I wrote this post I watched Australian country singer Luke O’Shea ‘s take on The Drover’s Wife. Pass the tissues, please.